Upper: Closed type spacer mesh, synthetic leather, TPU overlays . 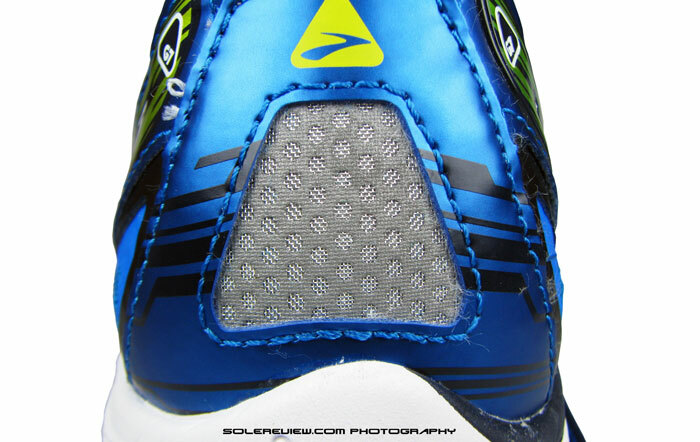 Midsole: Tri-density foam, rear-foot crash pads on outer and inner side, heel to toe EVA foam. Lighter and softer ride than Ghost 6, with similar upper construction and materials. The DNA gel pads have been removed so the ride comes across as cushioned, but ordinary. The Ghost has been Brooks’ neutral cushioning mainstay for over half a decade. Reputation (rɛpjʊˈteɪʃ(ə)n/ ) noun : A widespread belief that someone or something has a particular characteristic. It isn’t one to be trifled with, the aforementioned word. Takes years to build, and needs to be guarded with a great amount of zeal, as if one’s life depends on it – because it really does. Especially in the case of Brooks Sports Inc., whose success depends on a loyal base of runners shopping from specialty running retailers. Because of its focused approach towards product, Brooks shoes are more likely to be found on the feet of speedy runners than dress-down Friday adopters. They don’t have the broad appeal of brands like Nike, which skilfully slacklines between performance running and lifestyle sneaker-dom. 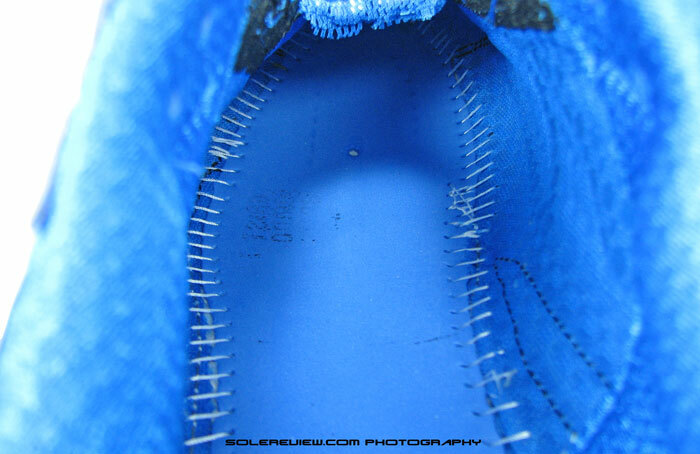 This is how the DNA gel pads look inside a Ghost 4 midsole. Why bring this subject up? Because reputation is built on a foundation of past experience and future expectations – based off the former. Making drastic changes to an existing franchise should be carefully deliberated through, because failure in doing so could potentially risk alienating long-time brand loyalists. Let’s take the Brooks Ghost as an example. For past many years, it has been regarded as an example of neutral running competence, blending cushioning sweet spot with agreeable levels of stability. The shoe complemented its slightly more expensive cousin, the Glycerin, but at the same time maintained a clear differentiation strategy based on levels of kit included. Till the Ghost 3, Brook’s liquid filled ‘Hydroflow’ cushioning system added a dimension to the padded feel. The impressive DNA Gel made its debut in the Ghost 4 (pictured above), its slimmer profile replacing the bulk of the Hydroflow, yet doing a stellar job at shock absorption. We first thought that the new ‘DNA foam’ was similar to the shear-thickening foam used in BMW safety motorcycle gear. Assumed wrongly, we discovered. A shear-thickening, NP2 foam protector from inside a BMW Ralleye suit. We had a suit lying around, so thought we’d show you. Wish Brooks used something like this. So if Ghost 7 is meant to follow in the exalted footsteps of Ghost 5 and 6, why deprive it of the very thing which was partly the reason behind past successes? We’re sure you already know what we’re talking about – the DNA gel. And what’s worse, Brooks makes no direct mention of this drastic change on their website, instead cramming the product detail section with loads of marketing fluff. So what’s in place of the Gel DNA? Nothing, just a layer of white midsole foam which feels like conventional EVA foam used in a lot of other running shoes. In our Glycerin 12 review, we explored the possibility that the new foam could have shear-thickening properties like the protective inserts (images above) used in motorcycle apparel. But after a few manual tests, we found that assumption unlikely to be true. We slit open the heel midsole and prised it open. Plain foam, no DNA gel this time. Changing the DNA moniker seems the right thing to do in this case. Otherwise, it is clearly misleading runners who buy the Ghost 7 based off their experience of previous models. The earlier DNA inserts had shear-thickening properties, which meant that they stiffened on impact. The foam used in G-7 does not deliver any of that. Such changes are not obvious on the surface, but instantly noticeable during runs. Ghost loyalists used to the rather multi-faceted cushioning quality of previous versions will see right through it, and this change risks creating polarizing reactions instead of the unanimous agreement on prior models. It is worth noting that the foam based DNA has been in use on Pure Connect/Grit/Cadence/Flow models for sometime, but it is unclear whether it is the same as used in the Glycerin 12 and Ghost 7. White midsole foam extends from heel to toe, buttressed by lateral and medial crash pads. 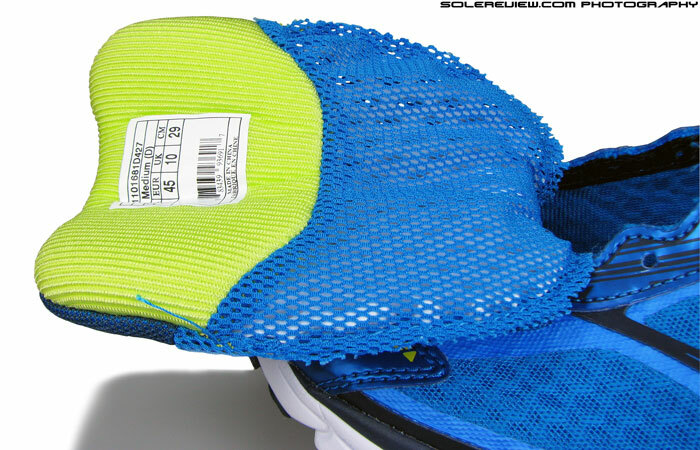 The scuff marks show that the midsole trampolines down slightly during foot-strike. Of course, the compression of crash pads play a part too. 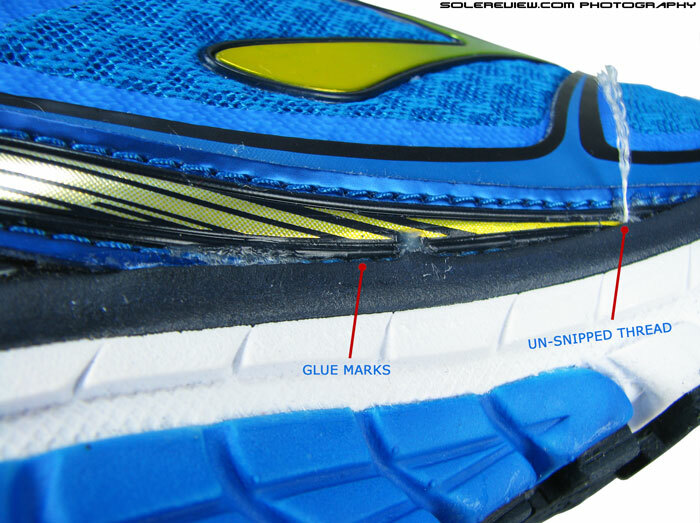 The midsole ride comes across as cushioned, more so than the Glycerin 12, which was relatively firmer. Somewhat akin to the Pegasus 31 foam without the Zoom Air bags, but firmer by 30% – if we had to put a number to it. After we had a few miles on these shoes, we suspected that the midsole softness was not the only factor contributing to the cushioned feel. The midsole thickness at its slimmest under-heel point is a mere 14 mm, so the midsole actually trampolines slightly during each foot-strike. In simpler words, the portion of heel midsole flexes downwards when weight is applied on it, making the heel area feel more softer than it is actually is. 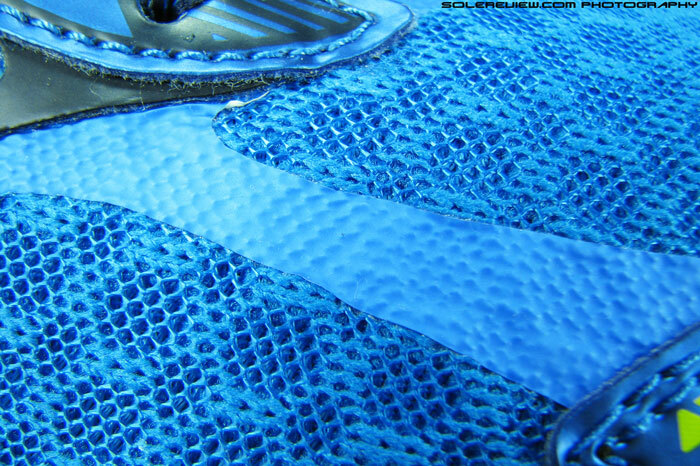 It was easy to verify that; we just turned the shoe over and saw scuff marks on the heel midsole foam. Given that the main midsole sits in a deep recess flanked by extended outer and inner crash pads, there’s no denying the midsole does that to some degree. Sockliner is regular, molded BioMogo type. Brooks’ landfill friendly BioMogo compound is used in the footbed. The EVA strobel under the footbed. Notice that small circle in the forefoot? We refer to it in later part of the review. To the shoe’s merit, the transition/weight transfer comes across as smooth, as the single density foam underfoot stretches right upto the tip. It is layered on top with the dual combination of removable footbed and EVA strobel, which produces an expected sensation of underfoot padding. Arch support is moderate from a midsole standpoint, though the upper plays a larger role in propping the arch area up. Outer rear-foot crash pad. Unchanged from Ghost 6, save for cosmetic makeover. The inner crash pad. 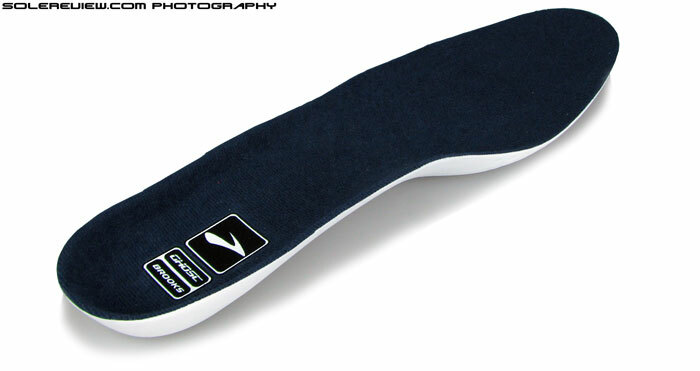 The heel crash pad is separated by a groove for gradual landings. 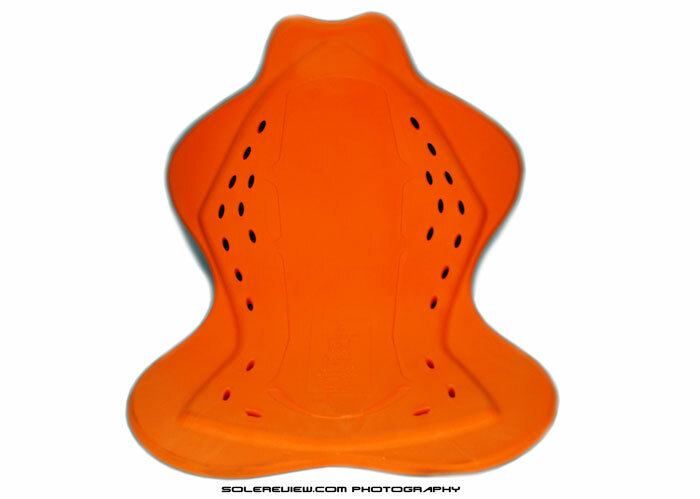 The two midsole crash pads are made from new molds, but virtually unchanged in firmness, design and placement. They do their bit, by adding stability in the rear-foot locality. We’ve talked a lot about this in our Glycerin 12 review, and similar sentiment applies to the G-7. It would be helpful if Brooks could better explain what the new ‘DNA’ material is made of. From a wear-tester’s perspective, it feels like regular EVA foam. If it is indeed the ‘ground-breaking’ material which the brand claims it to be, then back that up with data. Bio-mechanical laboratory testing is a thriving industry in the Pacific North-West (where Brooks’ HQ is) so a quick graph comparing the residual forces of last year’s original DNA vs. the new foam should not be hard to procure – in case Brooks does not have this testing facility in-house. 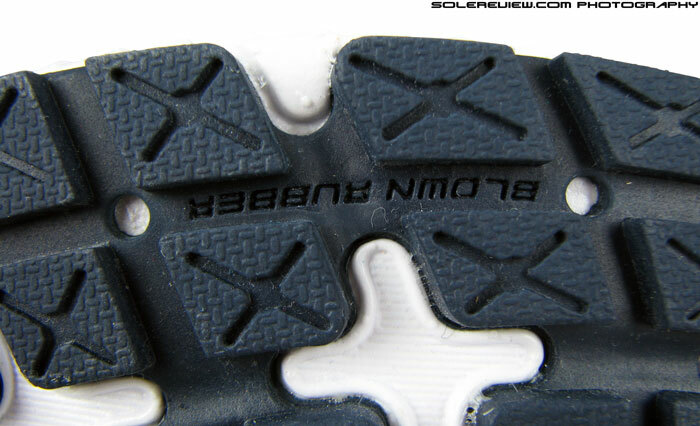 Outsole layout is identical to the Ghost 6. Only updates are seen on the lug textures. Blown rubber in the forefoot is softer than in the heel. We’ve yet to test a Brooks shoe where outsole durability was one of its stronger points. Predictably, it is average on the Ghost 7 too. The outsole has a few updates, but all of them cosmetic, having to do with surface texture only. From a real-world use perspective, they’re exactly the same as the outgoing Ghost 6. 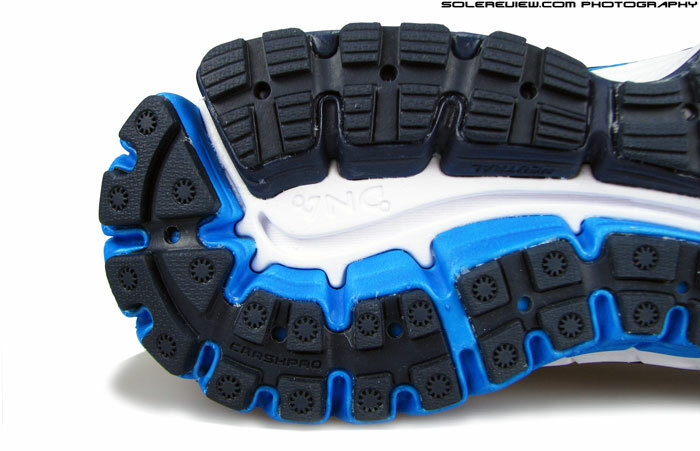 Unchanged layout of rubber pieces, similar shapes and same outsole compound. While grip is good due to placement of softer blown rubber portion in the forefoot, and harder yet sticky rubber in the heel, durability continues to be average. Regular users will experience fast wear and tear in foot-strike and load bearing areas, much like the Ghost 6 and Glycerins, present and past. On the plus side, mid-foot transition is smoother so is straight line stability; helped both by the filled up under-arch area and the heel-to-forefoot groove. While the flex groove set-up carries over from the Ghost 6, with exposed areas being in the exact same location, flexibility is slightly improved. No prizes for guessing why; the disappearance of forefoot DNA gel inserts makes that area easier to bend. Flat laces, thin membrane-que fusing and synthetic leather. Seen on last year’s Ghost 6 too. The G-7 gets welded logos instead of G-6’s stitched-on ones. Lightweight, rice-paper-thin overlays prop the upper up. Spacer mesh, which is smoother on inside compared to G-6. Upper is fundamentally the same as Ghost 6, with some common parts like the tongue and collar lining packages being carried over. There are small updates, mostly in the way how overlays are applied. While stitched-on synthetic overlays are still seen on the G-7’s toe bumper, eyelet area and parts of mid-foot and heel, welded layers are more common-place on this year’s model. To point out examples, both the side logos are fused-on TPU (Thermoplastic Urethane) ones, and so are the upper mid-foot panels. There’s also a secondary layer of membrane-like, heat fused structures which go over the toe box and beneath the mid-foot welds. This props up the upper, preventing it from going all floppy. The fit? Identical to the Ghost 6 except for one small difference. The forefoot is snugger, ever so slightly, as the base of the sides have this thicker ‘wall’ of welded TPU compared to last year’s fused membranes. The interior environment is improved by use of an updated mesh material – the reverse side of which is smoother than the type used in Ghost 6. The pay-off though, is noticeable only when you run barefoot in the Ghost 7, otherwise it feels just the same with socks on. Speaking of barefoot, the Ghost 7 isn’t the best model to go birthday-shoe running in. It lacks an internal sleeve, so tongue edges and seams are felt on the bare-skin. The upper fits true to size, as was the case before, with ample vertical toe-box space. Collar area looks identical to G-6 on the surface, but the Achilles cuff sees softening. Collar area uses the same lining materials and padding levels, but comes with an important update. Much like the Glycerin 12, the Achilles dip is softer than G-6. The height of the hard (and molded) heel stiffener is reduced, making the upper area move more freely. Minimizes chances of Achilles irritation if anyone found that to be an issue in Ghost 6. Tongue is a free agent, featuring the same construction as last year. Open mesh sandwiching a layer of perforated foam. 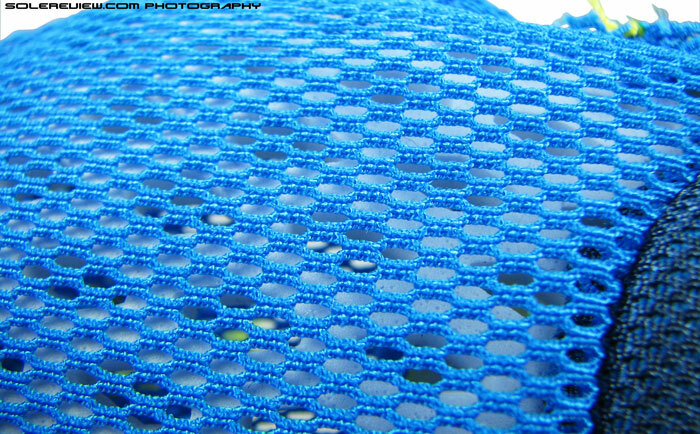 A close-up of the mesh with sandwiched foam visible underneath. A mini lace-loop prevents tongue slide. Eyelets are regular punched-in holes. Ghost 6 had two rows of speed loops. Tongue is unchanged in its entirety. The unique construction with sandwiched perforated foam shows up on the Ghost 7 too, with the same level of foam padding and lining softness. The sides are not sewn into the upper, but there’s a mini-loop which keeps the tongue from sliding across the foot. Top down pressure feels the same, despite a minor re-arrangement of the lacing set-up. The center speed-loops from the Ghost 6 are replaced with standard punched-in-the-upper eyelets, which makes the lacing narrower. Damage, if any, is that the earlier (fabric) speed-loops had built in reflectivity – which are gone now. Heel section of the Ghost 6 (left) vs. Ghost 7 (right). The reflective insert on lateral tip is carried over, though the one atop the toe-box disappears. Heel visibility is enhanced on G-7. Actually, low-light visibility is toned down on the upper downwards of the mid-foot. An earlier strip on top of the toe box is removed, while retaining the one on lateral tip. Thankfully, that loss is compensated by a much larger piece behind the heel, so you can say it’s a net-off. More adhesive on the upper, with a long thread sticking out of it sides. Ready or not, here comes the rather unsavory bit. There’s a larger problem at hand here, one that we think are symptoms of a deeper malaise in how Brooks approaches footwear manufacturing. The shoe we bought for this review was actually a manufacturing lemon, the type which should have pulled off the conveyor belt in the final quality inspection process. We can live with minor aesthetic flaws; after all, even brands like Nike have low standards when it comes to things like excess glue marks. Incidentally, Ghost 7 slips on that front too, with a un-snipped upper thread sprouting right from its upper base. Very visible too, long enough to fly a kite with it. Adhesive marks? Plenty of that too, with ungainly dabs of it on the upper and sole. The picture above shows you an example. But our pair of Ghost 7 came with structural flaws, and that is not good news. The issue? You see, all shoes are made which include a manufacturing process called lasting. This happens right after the upper and outsole have been made separately, and when it’s time for both to come together. 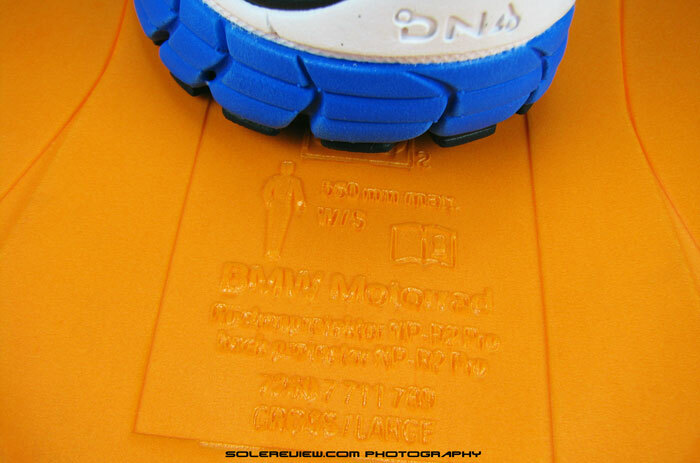 A plastic last (see 4th picture in this review) is inserted into the upper, and then using a combination of adhesives and hydraulic pressure, the upper is fixed on to the sole. Here it is very important the upper sits level on the sole before bonding, otherwise the resultant pair will result in fit issues. There are obvious fail-safes in place to avoid defects arising out of this process – like marking the gluing area with a disappearing ink, or having these two small Strobel holes below the foot-bed, which helps align with corresponding ‘marking dots’ on the last. Despite these measures, the defective Ghost 7 got through the quality checks, if there was any to begin with. One could argue that this was an isolated case, and should not be representative of the norm, but we disagree. The fact these shoes were selling at retail at $120 makes them a reflection of Brook’s quality standards. And we bought this shoe from a brick-and-mortar, running specialty goods store in Brooks HQ’s zip-code neighborhood – the very channel which has contributed to the brand’s stellar growth the past few years. So instead of returning them, we chose to review them. At least, if someone from Brooks reads this review, they will be able to see what their far Eastern factories are churning out. Despite our recent less-than-ideal experiences, we know that Brooks has a history of making superior products. We could have gotten unlucky with our shoes, but still, this is a worrying trend which needs remedy. So what exactly is the nature of problem in our Ghost 7? 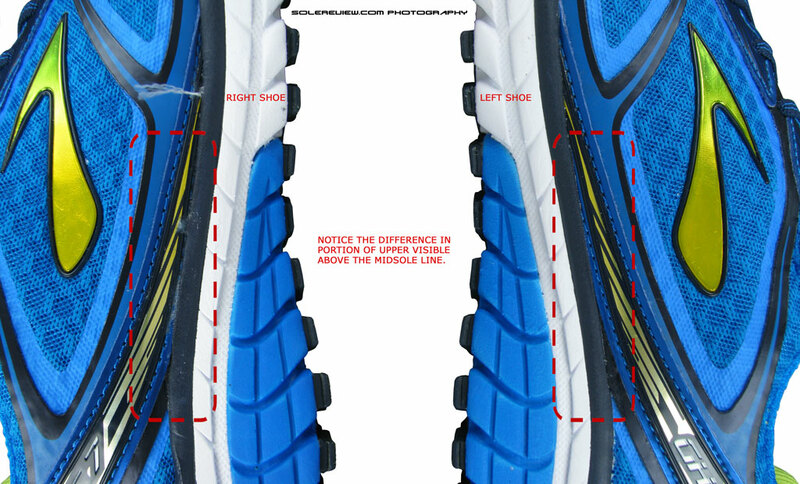 The right half pair (image on left) has been ‘lasted’ incorrectly, pushing more portion of upper inside the midsole compared to the left (image on right). The result is a tightness just in the center of the foot instep (below the tongue area), and a feeling of mild, localized discomfort sets-in after running 5 miles or so in a single run. Thank you for squinting your eyes and looking at the comparison pictures. That no look good, yes? We hope the well-meaning folks at Brooks can sort this Gremlin pronto. Okay, let’s consider an alternative, what-if scenario. Let’s say, we start with a clean slate, and the Brooks Ghost 7 was judged not by the weight of expectations, nor it had the shortcomings of faulty assembly. How would it fare against rest of the world? The Ghost is well cushioned, check. It is lightweight, ok. Heel to toe transition? Great. Fit? Satisfyingly snug. All the marks of a competent running shoe. At the same time, you can’t seem to get over the ordinariness of the shoe. But this is the real world, and unless you were a just-thawed Iceman just woken from a slumber of several thousand years past, comparisons are bound to happen. Which means long time Ghost users will quickly discover that the 7 does not possess the multi-tiered cushioning feel of Ghost 5 and 6, and will be wary of the Ghost 8 next year. And just for kicks, even if you were an actual Rip-Van-Winkle, you would soon get wise to the ways of the new digital world and search what people are saying about the new Ghost 7. In all likelihood, that path will lead you here, to this review, among other things. Hi guys, love your reviews. Just a question, often you point out that a shoe (even in the case of these ghost 7) is not meant to be used in “bad weather”. It seems that the vast majority of shoes aren’t. Why? Is because of the lack of grip? Bad weather means rain, extreme cold. Water will seep into shoes, and cold too. It seems pretty obvious, but we call it out anyway – because brands don’t really ‘weather proof’ it regardless of the month they’re selling in. Not so much due to the grip, though. What would work in bad weather? Something like Nike’s winter-focused Shield pack, water resistant trail shoes, Gore-tex lined running shoes (Merrell, North face, Salomon and the like) etc. But your question makes us wonder if there’s a better way to word that call-out. Thanks! Yes, the Goretex versions ride exactly the same except for the waterproof and warmer upper. While we’d love to do reviews on GTX versions, we’re constrained by resources – both financially and hands on the deck. We buy nearly all the shoes we review. Thanks for your reply. Understood, as long as they feel the same probably don’t need separate reviews anyway. (-: The Gtx versions are not readily available locally for try on, so was hesitant, but now am debating getting Ghost 6 GTX v. Ride 7 GTX’s. I’m currently happily in Ride 5’s and looking for that same light soft heel & forefoot cushiony feel for the cold and/or wet weather. We’d choose the Ride 7. Great shoe in it’s regular version, and the GTX version has a lower upcharge. Thanks. I tried the Ride 7’s on in store yesterday which felt less cushioned in the forefoot than my Ride 5’s in side by side comparison. There were no Ghost 6 available, but Ghost 7 were similarly less impressive than my Ride 5. Could it be just due to ‘new v broken in’ feel? Some shoes come into their own only when you start running in them, so at times first impressions (on store floor) might present a different assessment. That said, we haven’t reviewed the Ride 5, so can’t say how these two versions compare. You’re welcome. The Ghost 8 will be out by May next year, so the 7’s will start entering closeout pricing somewhere around March. Good luck with the 6 GTX’s! For a guy who runs all his workout, except for long and easy runs, in nike free 5.0, what would you suggest for such workouts between pegasus 30 or 31, saucony ride, ghost 7 on nb 980? Saucony Ride. Haven’t tested the 980 yet, so can’t comment on that one. Where do you see the drop as 12? a) Cut the shoe, drill holes in the heel and forefoot center points and use a cylindrical gauge. b) Use an ultrasonic thickness gauge, which allows non-destructive measurement. We have plans to buy one, but maybe a year down the line. Till then, all our quoted drop measurements will be brand specified. We mention that in our list of performance reviews. Very good review. Bought the Ghost 7 after having bought the Glycerin 12. I liked the Ghost better. I actually felt it had a softer underfoot feel. One thing I did notice was the quality of the shoe was not as good as the Ghost 6. I had glue spots and threads. It something that yours is the only review that caught this. You must be paying attention to the details! Thanks! The Ghost feels softer because of the ‘trampoline’ effect and the thin midsole foam. It is unfortunate that your shoe also had finishing defects – hope someone from Brooks catches this and fixes this pronto! I did a comparison using Shoefitr via Running Warehouse’s website and the Ghost 7 came in with a much narrower heel than version 6. Did you also notice this in your fit test? No, the heel/collar feels the same (in width) on both versions. 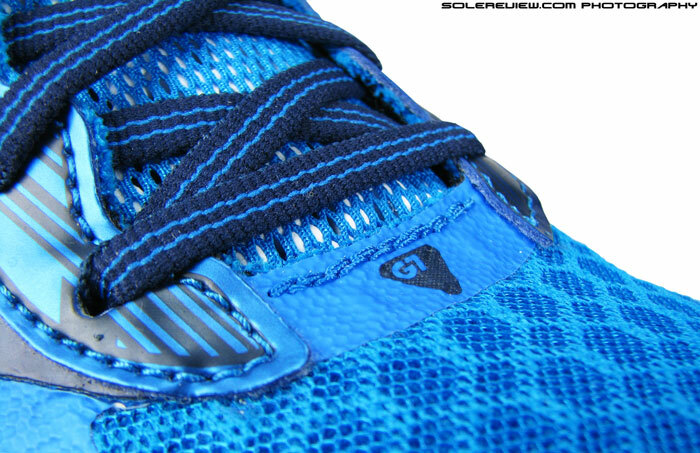 The Ghost 7 has slightly more padding in the collar, so that could be the reason why Shoefitr says so. Once you lace both the shoes up, there is no difference at all. Thanks for this review. I have been a long time fan of the Ghost series but just ran in the Ghost 7 after skipping the Ghost 6 due to an Achilles injury that kept me from running very much. I would agree that the cushioning is different, and I came off of the run with my Achilles not feeling particularly great. Do you have any suggestions for a different shoe? May we suggest the Saucony Ride 7? Positive feedback from most runners, and from us too. Thanks for the suggestion. Had a great first run in the Saucony! That is great to hear Suzy, awesome! Thank you for your great reviews! I recently purchased this shoe after trying on several neutrals during my shoe fitting. I have a mid strike with a low arch. I found that the Ghost 7s and the Saucony Ride 7s both relieved my shins from the impact i was feeling when running. I made the decision however based on this pain i was feeling in my foot arch in the Saucony Ride. Given your reviews of both shoes, I am wondering if this was attributed to the shoe not being broken in. Also, I asked the associate who was helping me about the Pegasus 31s, and he mentioned that ,although they are very comfortable, the comfort doesn’t last as long as the other two brands mentioned. Overall, I am looking for a shoe I can use for 5 ks as well as sprint training and I would love your insight in the matter. I do not see myself exceeding 10 miles on runs. Shoes behave in different ways for people, so your experience with the Ride 7 might not have matched ours. Not sure if it was just your feet getting used to the Saucony or something else in the construction not agreeing with your foot anatomy. Not sure why the associate said that the other two brands will last longer than the Pegasus. Did he have a basis for his comment? All three shoes should be at par with each other as far as cushioning life is concerned – after all, the base material used is EVA foam. Except Nike, which has a heel Air bag inside. What’s your current shoe for sprint training workouts? Any feedback will help us bring up some choices. Thanks for your quick response. This site is a great find. I was using reebok smooth flex cushrun. It didn’t work too well for my mid strike since I felt shin pains after a 30 miles. I assume it focused too much on heavy heel striking. Also the material on the inside wore out quickly and caused painful blisters on my heels. Overall a poor investment. 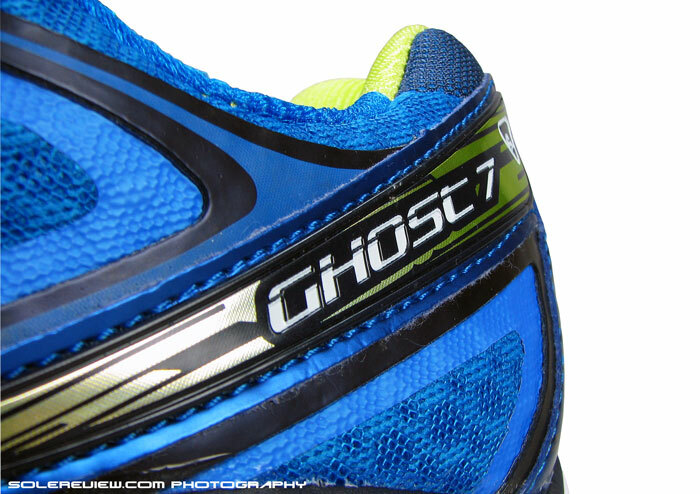 Do you think the ghost 7 would provide a good transition, aiding in sprint training and 5-10k distance running? Really depends on the frequency of your sprint workouts and the speed at which you do them. The Brooks 7, in our opinion, has too much bulk and upper room for sprints. The bulk limits the quick touch and go needed for acceleration, and the relatively roomy upper might cause blisters in case the foot slides inside during sprints. That’s why track racing shoes are so minimal and snug, restricting any internal movement. Something like the Saucony A6 is a good mix. Otherwise there’s the Brooks Pureflow and Pureconnect. If you leave sprints out of the picture, the Ghost 7 will do just fine. Yes, transition is good and so are the cushioning levels. Thank you. I will probably go try the saucony A6 this weekend. It seems like it has exactly what i’m looking for. Happy to help. Let us know how the A6 turns out for you. Thank you for writing in! What Nike’s are you in currently (the ones which give you pain)? 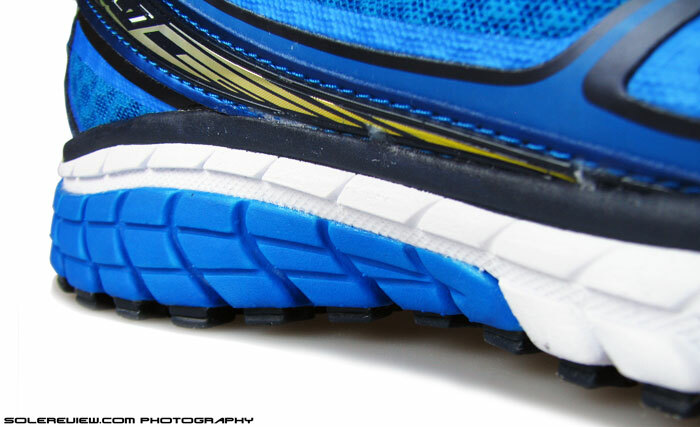 a) Brooks Transcend – plenty of cushion, support and grip. The upper fit is a bit shallow. Expensive, but its been around for some time so there should be a healthy knock off its original retail price. b) Nike Pegasus 31 – very comfortable sole and upper, with acceptable levels of stability. c) Saucony Ride 7 – cushioned, lightweight and roomy inside, but watch the mild tongue slide. As with all our advice, this is just a general recommendation, and you should try all these shoes before deciding which one to go for. So glad to have found your review site! I have run in Ghost 6s and was looking forwards to the 7 – but have been so disappointed. I lost part of the black caterpillar track on the heel after 2 short runs and found runs over 5 miles were painful in one foot. After reading your brilliant review, I believe my shoes are also affected by the “last” issue. The right shoe is out by over 1cm compared with the left – and when so much science and research is supposed to be involved, you might wonder what the result is? Well, I can tell you – it’s a thudding sore plantar after 5 miles. I’m disappointed at Brooks and will have to think twice about looking at their next offering. On the strength of your work, I’m off to buy a pair of Saucony Ride 7s. Pegasus 30 should do it. I must say I’m pretty impressed by your thorough reviews and surely they stand out among others by comparable websites. I found them pretty informative and useful especially regarding the crude analysis and specs. So thank you. Why I am commenting on this review in particular is because I have a pretty huge amount of spent Ghosts in my locker, and also a Ghost 7 on my feet. I find a couple of issues I really can’t agree with your review. Of course feet are different, but I can at least vouch for one mistake on your evaluation of recent Brooks. The quality issue is really non-existent: I have taken a closer look at my 3 Ghost 5 and one Ghost 6. They all present the same stitching and glueing issues you reported. The lines really don’t match on both shoes and perhaps the Ghost 7 is the least apparent case in my situation. I don’t have my older Ghosts at hand (up to model 2) but I think they wouldn’t be much better. Anyway, that particular out of the way, I have to say the 7 are – by far – the most comfortable and durable Ghosts I remember, in the last three or four pairs I had. They are way, way better than the six in my opinion. So, maybe the DNA had a different impact on your foot, a worse one, and it also has a different impact on mine, but a better one…I actually prefer them to my pair of Glicerine. Hey, that’s ok, not everyone has to agree with our reviews. Shoes behave differently based on runners. We hope our reviews just provide an informed perspective, and that’s all we intend to do, nothing more. Glad to hear that the Ghost 7 worked so well for you, happy running! That said, the misalignment on the Ghost 7 is an assembly issue, coming from our factory work experience. What an misaligned upper tends to do is adversely impact the fit in some cases, which in our view, is a no go. I perfectly agree that one can disagree on the results of a review, especially on subjective arguments like this, and still consider the review informative and valid. I just wanted to provide my feedback in correcting one assumption and offering my (debatable) point of view on another one. The misaligned upper occurs in each and every pair of Ghosts I have, four of them, besides the 7. They’re more pronounced on my 5s (all three pairs) and about the same amount on the 6. I don’t have my older Ghosts around but I can check if you’re interested. From your review I understand you think this issue wasn’t happening before the 7, but I found it on 5 pairs out of 5 instead. My point of view, which is far more debatable, is instead about the superDNA. I swear I didn’t even check the specs and features when I bought the new model, so I didn’t know about the change. But I instantly recognized a better shoe (yes, for my foot, subjective). I just wanted to say the marketing issue you criticize maybe isn’t so bad, since in my opinion the show has improved. It might not be the same exact tech inside, but the result is similar and improved. Again, in my opinion, the change in the tech used alongside the “super” moniker makes sense. Anyway, let me reassure you the review is still excellent. Thanks. Thank you for the feedback. Helps other readers to see a different point of view (than ours), which adds depth to content on this page. We’ve reviewed Ghosts 4-7, but at the same time, did not say the assembly issue did not exist before. Our reviews have become far more detailed (more time spent wear-testing, scrutinizing, writing) since solereview went full time in May this year – this means insights previously unnoticed come to the fore. Regardless, this is a manufacturing defect which Brooks needs to address. There are clear, pre-production markings on upper patterns (so that stitching is proper) and also on lower part of lasted upper with which needs to align with the midsole edge during pasting. Running shoes are industrial products, and each finished product should mirror the QC sample the inspectors have on their line – minus the variations. The DNA part, as you pointed out, is debatable. We feel one way, and your experience states otherwise. And that’s perfectly cool. We’d think there was something wrong if all of our readers agreed with everything we write! Yes, of course. I didn’t want to debase your review in any way. I got the feeling your review summarized as a let-down from previous models, hence the quality issue compared to them. I just feel them more comfortable, less impact and fairly stable. At the same time I also feel less the pavement and its irregularities. I alternate between a 6 and a 7 and they’re both almost new. The 7 allows me to go out even when my feet are a bit sore, while the 6 sometimes worsens the pain. The Glycerine 11 incidentally, performs worse than the 7 I guess for one or two reasons: I had to buy half a size larger and the toe box feels to me less roomy. If you loved Super DNA, then you should run in the Brooks Transcend, which uses a great deal of it. Have you had a chance to try them on? The Ghost 7, in our opinion, sits on the fence. The DNA foam layer is pretty thin, so part of the cushioning is delivered by the under-heel midsole trampolining with each foot-strike. The Glycerin 11 did not impress us much either. 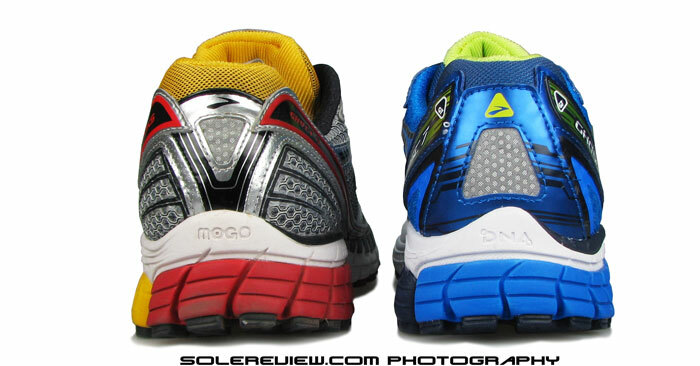 Agree that forefoot was tight, and we liked the versions 9 and 10 much better. I will probably buy blindly a Transcend as soon as my Ghost 6 are spent, or even before, but at the moment in already rotatingn three pairs. Also, I would like to wait for them to decrease in price 🙂 although I’m starting to be pretty wary of shelf life. Last Ghost 5 I bought were pretty cheap, but lasted way way less than the first pair I bought almost two years before. I didn’t believe when people told me that, but my (still) sore feet say otherwise ! The Transcend 1’s should be up for grabs pretty cheap now, given version 2’s imminent release. Already see the price at near $100 levels. It is a great shoe if you know what to expect. Read your review of the Ghost 7 yesterday, and you just gave me an AHA! moment in trying to figure out why my left foot only was experiencing top of foot pains, and oddly enough pain on my non medial side. Took a look at mine and sure enough, the left shoe is stitched lower on the medial side. My guess is that it is squeezing my already not the strongest arch down, and not allowing it to flex properly, causing to exasperate any late stage pronation issues. I’m over my 30 days with Brooks, but will see if they can help a fellow out. Thanks for the great reviews by the way! Love how in depth they are. Brooks should take it back regardless, because what you see on our pair (in the review) and your’s too is a manufacturing defect! The store I purchased it from is going to exchange it for me. * I apologize if this post shows a second time. I tried to post earlier and it didn’t seem to work. First, tremendous work and thanks for what you do. Second, seeking a little counsel: I’ve gone through two pairs of Ghost 5 and one pair of Ghost 6 and have loved them all. Recently though I bought two new pairs of Ghost 6 and have already returned one for a defect. Unfortunately, I’m going to be returning the other pair for the same exact issue. So, if I were looking to try something different and not just jump into the Ghost 7 what would you suggest I look into? I’m 6’2, 210, mid-foot striker, neutral, and I’m logging about 15-25 miles a week (half marathon runner). No problem about the unintentional double posting, sometimes happens to us too. We’ll post a reply, and it won’t show up! What was the nature of defect in the Ghost 6? Would be helpful to know. With both pairs I had the same issue- on the right shoe, on the outside of the midsole, I could tell that it didn’t lay flat. I noticed it within the first mile. Felt like there was a hump of sorts in the shoe. Went back to my old shoe to confirm that it wasn’t me. 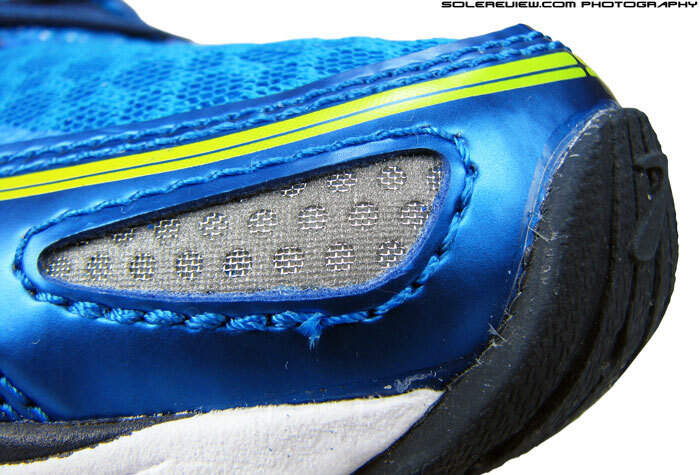 I also noticed on the shoe the issue you described up with the upper being stitched poorly. The hump sounds like midsole warping, an instance of a shoe exceeding accepted variance levels during manufacturing. What prompts me to post is a few things but agreeing with your review as well as most of the comments that followed being a start. The next being that I have Ghost 7s currently and feel they are probably the worst running shoes I’ve had in the past 2 years (a close second would be the Vomero 8). My question is what’s a good alternative to the Ghost 7? I’m a male in my late 30’s, 5’10” and fluctuate between 175-180 lbs. I’m somewhat new to running. A long time ago I played 2 sports in college and some minor league stuff after college but never really ran outside of the sport I was playing at the time. Fast forward to 2 years ago and a girl I was dating got me into running. Since then I’ve kinda grown addicted to running. Currently I run anywhere from 3-5x a week on a treadmill and average about 20 miles per week at roughly 8 min/mile pace. I also ride a stationary bike 5x a week and average about 35 miles a week at roughly 3:30 min/mile pace. Weather and location limit my current workouts to treadmill and bike but ideally I’d like to run outside 3-5x a week. My goal is to run 9 miles at roughly a 7:30 min/mile pace. Since taking up running 2 years ago I’ve gone through 4 pairs of running shoes purchased between 2 local running stores. I’m making a distinction of where they were purchased at because I think it is somewhat relevant and should become clearer later. – first legitimate running shoes that I got properly fitted for. This was purchased at local running store. They measured my foot, had me walk barefoot throughout the store as well as run about 60 feet before having me try any shoes on. Once I tried shoes on they got me on a treadmill to see how they felt as well as how looked on my foot while I ran (to see if they support properly?) The individual that helped me said everything looked good in my stride and he didn’t see any major issues with my feet. Not sure how many I tried on and ran with, I think it was 2 or 3 and don’t remember if they were different brands or just different model of the same brand. He felt the G5 looked the best on my feet when I ran so I deferred to expertise and purchased the G5s. Those shoes lasted me about 5 months and a little over 400 miles. – bad choice that was my fault. Purchased at a different running store in a different state and was helped by a kid that ran on the track team of a nearby small college. Basically I bought these because I thought they looked cool. He asked me what my current running shoes were and then brought out like 3 or 4 pairs that all varied in brand. Not sure why but I wanted to try something new so I ruled out the pair of Brooks (not sure if they were the G5s or G6s). My brother runs a lot and has Asics so I ruled those out. Don’t remember the others except that the Nike’s were neon so I went with those. Didn’t like these. As with the G5s, I was running mainly outside. What I found myself doing, which was different than the G5s, was that if I wanted to run 7-9 miles on a Sunday with minimal shin splints or calf pain I’d have to run 2-3miles, with shin splints and calf pain, on Friday then take Saturday off. With the G5s and looking at my RunKeeper app there were many Saturdays I ran 5.5 miles and then 9 miles on Sunday. I remember thinking the shoes were an issue and I should go back to where I bought the G5s. I put roughly 400 miles on these as well. – same guy who sold me the G5s helped me again. Brought both pairs of shoes in, he looked at them and asked me what I liked and didn’t like about each. Can’t think if I had anything negative to say about the G5s so probably didn’t but did tell him about all shin splints and calf pain in the Vomeros. I asked if it was do to running too much or how I’m running and he said “no” it was the shoes. Fitting process was same as first time, try a few pairs on, got on the treadmill. I think because I told him I liked how the G5s were compared to the Vomero he only brought out Ghosts and the Dyad. Told him a goal was to run a 10 mile run once a week so he said Dyad was the pair to go with. These worked well for a couple months but then I started to get some pain on the outside of my right knee. Mention it to my brother the runner, gave me a few stretches but said sometimes when shoes are at the end of their lifespan you’ll get goofy pains if there isn’t anything severely wrong like an injury or the like. Also noticed a really funky smell from the shoes. 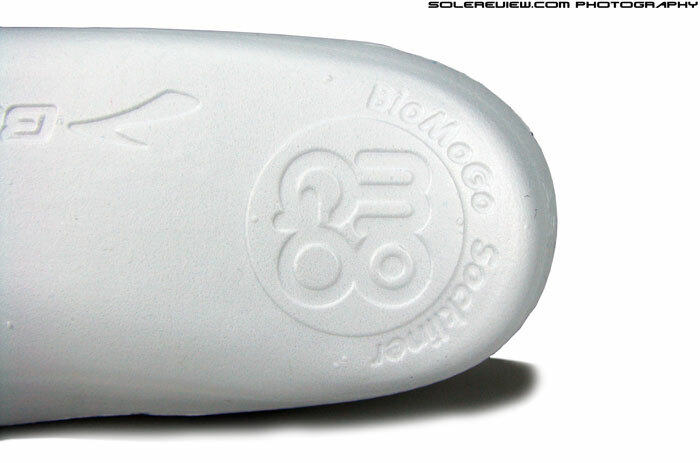 I still have all my running shoes and to this day the G5 and Vomero smell nothing like these. I think I had these for a little less than 4 months and a little over 300 miles by the time I went back to get new shoes. – same guy has now helped all 3 times I’ve been to the store. Told him about the knee pain and smell. Looked at the shoe and said wear looked normal and that it was just time for some new shoes. Smell he said varies from brand to brand and nothing you can really do other than air them out or have 2 pairs of shoes and alternate their use. He said if I buy Brooks again and the smell is still an issue to try a different brand but it’s nothing to worry about. Since I couldn’t remember anything bad about the G5s I got the G7s. The only shoes I tried on were the G6s and G7s. I asked what the main difference between the G6 and G7s were but he said nothing, just aesthetic. I think the G6s were even cheaper but I liked the yellow on the G7s (lame I know!) so I got those. First off, these things smell worse than the Dyads. Maybe getting older means greater foot odor? Right off the bat I got a really bad blister on my right foot big toe (looking down at right foot, on left side of big toe where the toe touches the inside of shoe, not the end part). Nothing had changed as far as socks, weather or distances I was running. On my G5 I had minor blisters I’d only notice after running and taking my socks off but they’d be gone for the most part the next day and never kept me from running. Don’t remember blisters on the other shoes. The blister on the G7 would limit me running to only 3-4x a week. This went on for about a month and then my toe finally calloused around that area. In addition to the blister I had other weird issues but chalked it up to getting older. Achilles pain in the first month, left calf pain basically for the duration of running in these (not both calves or shin splints like I’ve felt in the past but just my left calf). All three of those I could attribute to my running style or just my body I guess. What’s hard to attribute to me is yesterday at the gym I kept hearing a noise when I walked like I had a rock stuck in my sole. I’d check but no rock. Finally after finishing my workout and hearing it again I took my shoe off in the middle of the gym and looked at the shoe. It appears that my right shoe has worn out the yellow tread (I have the grey, red and yellow pair) on the outside and I’m walking on the underneath white foam stuff? This being after a little over 250 miles of use. For the most part my diet, frequency and distance running hasn’t varied much in the past 2 years. Plus, these things stink! These past 3 months is first time in 2 years I’ve spent more time on a treadmill than outside but that’s due to location and weather. I’m still running the same amount time in a week than I have in the past but I’ve added stationary bike riding so maybe that’s why the bad experience with the G7s? Ok, last thought. This local running store has mostly Brooks running shoes. They don’t carry Nike, not sure why but don’t. I remember seeing a couple New Balance shoes, I think I tried on a pair of Saucony or maybe Asics. I believe they carry Mizunos and Altras too. The few times I’ve been there I do remember thinking to myself that Brooks must be the go-to running shoe because they didn’t carry much of anything else. I don’t have anything against Brooks other than the last two pairs smelled something terrible and the G7s are the worst of the 4 running shoes I’ve owned but it’d be nice for variety sake to try something else. There is another running store about 20 minutes further than this one so I guess I could try that out. The store I bought the Vomeros at is not an option as that’s in a different state than where I at now. Seeing people talk positively about the Nike Air Pegasus 31 and your review makes me want to be able to try those on. I dunno. This is WAY too long! Long comments (with detailed feedback) are great, as there is much to be learned from reading them. Enjoy going through these, but when it comes to responding, we tend to ‘park’ these for a while. So a typical response time will stretch from the usual 1-3 days to around a week, which is precisely what has happened here. So apologies for not replying any sooner. Based on your experience with Vomero 8 (shin+calf pain), Dyad (possible ITB flare-up), our guess is that shoes which combine cushioning+stability work for you – like the Ghost 5. It seems that anything with more heel sink or lateral bias (Vomero+Dyad) puts additional stress on parts of your lower body. As far as the G-7 blisters are concerned, can’t really say. Don’t think very highly of Brooks’ manufacturing standards, so it is possible an assembly issue could be the cause. The Pegasus 31? 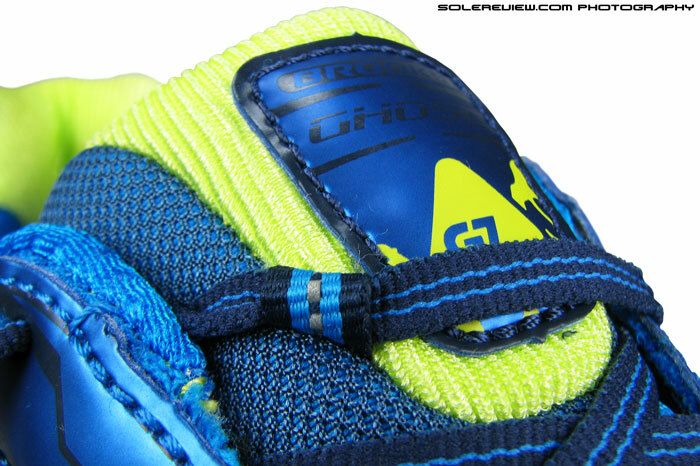 Know that it has an identical Zoom Air bag in the heel, so slight chance of Vomero pain redux. Would be better to stay safer than sorry, and not buy them. Reading your detailed experience, couldn’t help thinking that your knee/lower body is vulnerable to minor injuries. Won’t hurt to start including regular physical conditioning into your schedule if that isn’t already the case. Hit Glutes, Hamstrings, Quads, Shins and Calves workouts so that they become a stronger support system for your joints. And of course, Achilles and PF conditioning/stretches. 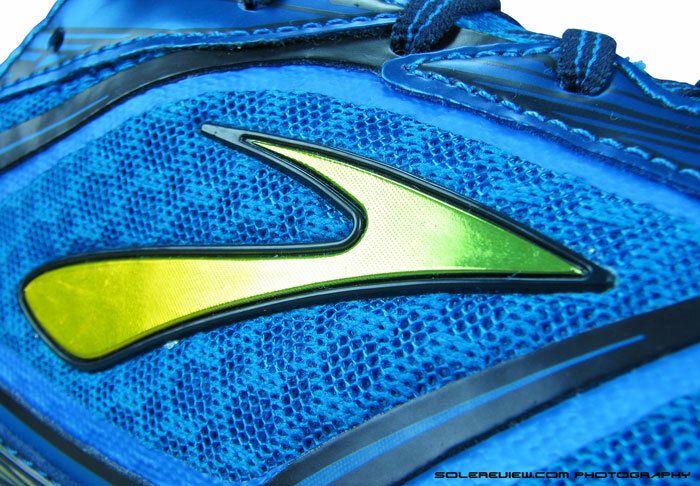 You could also try Mizunos – like the Wave Sayonara 2, but those ride relatively very firm. Thanks for the detailed reviews. I’m a heel striker with high arches. I’m 5’8, 155 pounds, running 20-30 miles per week. I need a shoe with heel outsole durability as well as ample heel cushioning. I’m currently running in Glycerin 12 but wonder if the additional cost is really worth it (the outsole does not seem to be very durable). 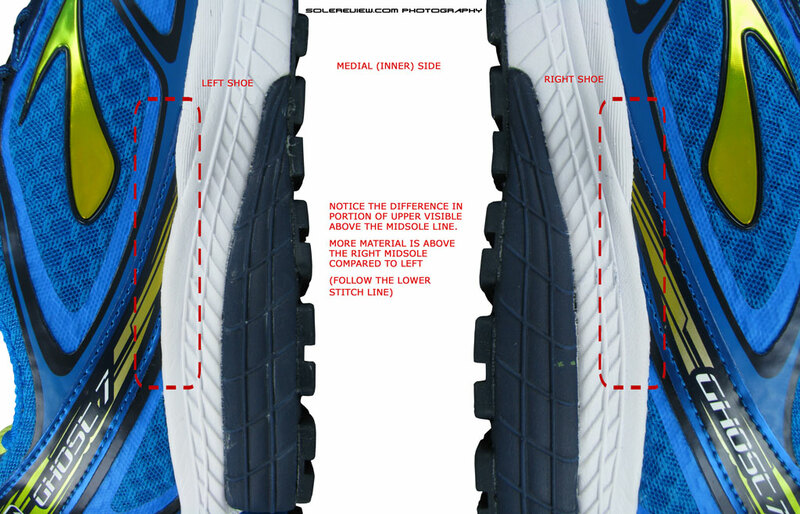 I looked at the Pegasus 31 given your recommendations but the heel outsole is less thick than the Ghost 12. In reference to the Pegasus 31, although the heel outsole is thinner that the Ghost 7 do you believe it is more durable and will last longer? Any shoe recommendations for a pronounced heel striker that needs cushioning and heel outsole durability? Not sure how the heel stack heights match up, but we’d still recommend the Peg. The Pegasus 31 has a Zoom Air heel bag, so it performs well on heel cushioning. It is also definitely more durable than a Ghost 7. If you had to choose (other than basing decision on price alone), Pegasus 30 or 31? Thanks again for the detailed reviews! When it comes to ample heel cushioning, the Pegasus 30 would have our vote. Durability is better than Brooks too. Wish I’d read the review first. Bang on the money. Also have a duff pair, blister on right foot after less than 3 miles. I’ve done over 2500+miles in others with out a single problem. Very disappointed as I’m quite a brooks fan. They have some good designs and materials, but they’re letting the ball slip during production runs. The Glide 6/7 is more flexible, but there’s a catch. The flexing point for adidas is a little ahead of the metatarsal (ball of foot) where the midsole become a bit thinner. On the other hand, Ghost 7 takes more effort to bend, but the flexing area is slightly before metarsal, at the border of midfoot-forefoot. So you have to decide based on where do you prefer the shoe to bend. Just want to put my 2 cents in here. I’m 74 and gave up running 30 years ago when my joints expressed their unhappiness. Been walking 15-25 miles a week ever since. Picked up a couple pairs of Ghost 6’s on sale and have to say that, as a walking shoe, they are fantastic. The Ghost 6’s were great shoes, and happy to hear that they perform well for you. Thanks for the feedback! An interesting read. One pair of the G7s (green/purple) got me through a marathon with no blister issues. Another pair (pink) that generated a hotspot that didn’t quite reach blister status at 6 miles & a pair that generated a hotspot during a 14 mile run. I’ve ordered a pair of Saucony Ride 7 to give them a try instead. The hotspot could be because of a similar issue we faced in our pair. Your comment was posted a few days ago – did you have a chance to run in the Ride 7’s? I can’t make my mind up about the Ride 7’s. I really love the ride of the shoe but the toe box is a bit on the narrow side for my feet. I’ll definitely keep trying them and hopefully the toe box will eventually give a bit. I’m still persevering with my pink & blue pairs of G7 which are okay for shorter runs. I’ve bought another green/purple pair which are just as comfy as my others. Well & truly broken in after 4 runs! Thanks for the feedback. 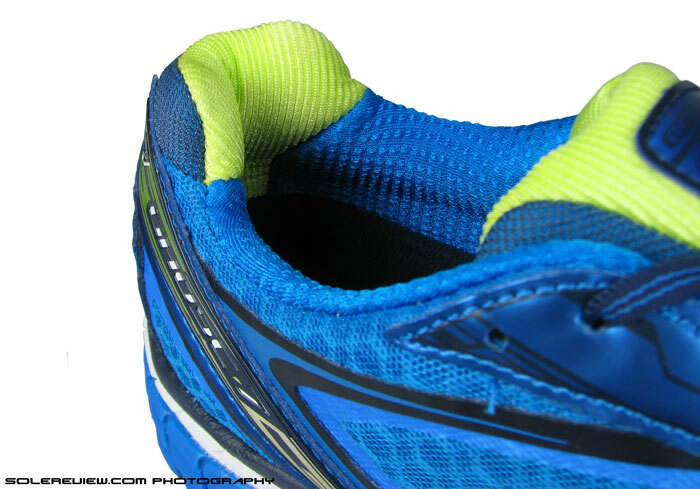 If a narrow forefoot bothers you, the Triumph ISO is a shoe you could try. Interesting. Hard to guess why, though. Ghost7 has been my workhorse and go-to shoes for easy and long runs. But I wonder how does it compare with EB2? Too very different shoes – the Energy Boost has a more ‘bouncier’ ride, and a snugger upper. I was just thinking about getting the Ghost 7 after having 3 pairs of the Ghost 6. But now seeing that there are some differences I’m not sure if I should move to the 7’s. I run 20-30 miles a week, 185 lbs, mid foot strike and neutral….what would you recommend instead of the 7’s? That’s a tough one. The removal of DNA gel inserts makes the Ghost a different shoe now. You could try the Adrenaline GTS 14 (yes, a support shoe, but should work ok) or go for Asics, like the Cumulus 16. But if you liked the upper fit and feel of Brooks and don’t want to experiment, then the Ghost 7 is an option. Hey, your website is really something and I am thrilled to get to know your review. So sad that brooks cancelled the DNA Gel. Thanks for the comment! 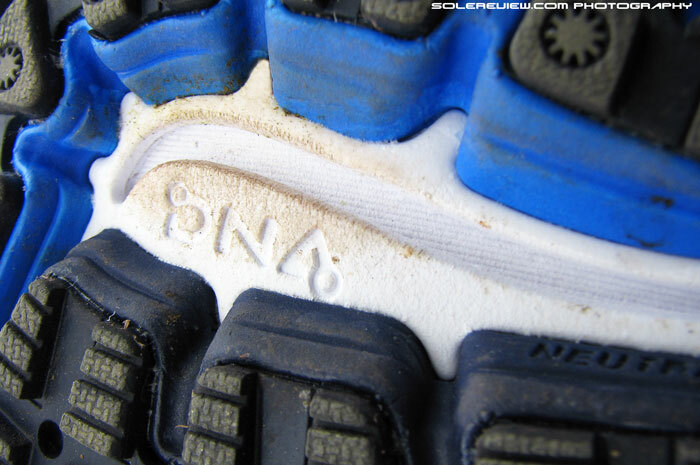 Yes, Brooks is moving away from DNA Gel, but some of the shoes like Beast 14 still have them inside. As you have predicted in the review, outsole durability is still an issue with the Ghosts. Also as you have said there were quite a few quality issues with my pair. There was some glue residue in one of the shoes, and if you put the two next two each other you start noticing that the outsole has been molded differently. It’s a little off here and there between the two shoes. Here’s some pictures after 700 km. Don’t know why I posted as a guest before, but I forgot the picture of the back of the shoe. Appreciate the pictures and the feedback. Although, not as bad as we thought it would be. For a mileage of 700 kms, that soft rubber is doing fairly ok.
Hard to say what’s causing the issue unless we take a look at the shoe. Does the Ghost 7 fit you looser than the Mizuno and adidas? Hi I have gone through several generations of Ghosts over the past 4-5 years. I am concerned about the G7 based on some of your points up above. Also, I have a lot of difficulty finding the older generations because I have always worn 11.5 B (Narrow) size of the Ghosts. Can you make any recommendations for alternatives to the Ghost that run a bit narrower than the D that the Ghost provides? I would really love to find the exact shoe that I’ve been wearing, G4-G6, B-Narrow. No, we draw a blank on that one! Sorry that we couldn’t be of any help. All is not well with my Ghost 7…….. hopefully only “yet”. Being a D width that i’m trying (just walking around the house to trial), i’m finding the width of the midfoot too narrow for me. I can feel pinching on the right hand side foot around/under the arch. I’m hoping this will be resolved when my 2E replacement come. i’m hoping its just the D shoe is just too narrow for me? and its not something that is going to bother me under the arch. it appears the inner sole is very curved at the arch which may not suit, but we’ll see. I could always resolve that with another inner sole. The midfoot of these D width Ghost 7 is about 0.5cm narrower than my Inspire 10. But re-reading your review, it appears i’ve got the same quality control problems with this pair that yourselves had. Yours actually look good compared to this pair!?!?!? I really hope two things when my 2E pair come. a) the midfoot/arch area is wider (2E right, so should be?). b) they are built right!! Different brands have their own norms when widening shoes, but generally speaking the midfoot fit is also slightly broader along with the forefoot. Yikes! Your Brooks 7 makes our pair look super kosher! Hoping that your 2E provides both midfoot free and a bug free assembly. Thank you for the very detailed note, Jack! Happy to hear that the Ghost is working well for you – our high scores also think of the shoe as functionally effective. Our problem with Brooks DNA is that it strays away from what the brand’s original promise. Here is the facebook link to one of the initial DNA videos (2010). a) That the non-Newtonian DNA material is supposed to be shear-thickening. b) It reacts instantly on impact. Both present a conflicting viewpoint with regards to core behavior of the original DNA. Agreed, our hammer test was crude, but the logical outcome should have been a harder foam if the BioMogo was really shear thickening. The BioMogo DNA foam is just a soft, cushioned foam, and that’s pretty much all there is to it. Every foam responds at a molecular level, and the BioMogo compound is no exception. The Ghost 7 is a good shoe, and our high scores support that sentiment. It is only the brand’s interpretation of BioMogo DNA that we don’t agree with. Again, loving your reviews. Currently running in Asics nimbus 16 and they are my workhorse long distance shoe right now. It is a slow, boring, stiff shoe but it doesnt hurt my feet and it protects my legs from getting tired on 20+ mile runs. The only thing on my wish list is something about an once lighter with equal impact protection and a full contact sole with more flexibility. Do you think the ghost fits this bill? Glycerin is an option but it is even heavier than nimbus. I am a forefoot stiker/supinator. I have had a pair of brooks pureflow 2 and love the way the cushioning feels underfoot. If I could get something that was a hybrid of PF2 and nimbus 16 I believe this would be the perfect shoe for me. Can’t wait to hear your recommendations. Don’t have review experience with the PF2, but a shoe which is an ounce lighter, cushioned and more flexible than the Nimbus 16? The Speedform Gemini – a full 1.37 Oz difference for a size US 11 and will do the things you want it to do. Thank you for teaching me about the “lasting” process. Now I understand why my Ariels have been driving me crazy. The left one is measurably tighter than the right due to the same defect you documented here. Too late to return them, but I will always check for this is the future. You’re welcome! Brooks seem to be notorious at this issue – going by many reader comments on solereview. Hello, thanks for your reviews, I enjoy them a lot. Here is my 0.02$ on the Brooks Ghost. For starters I have a low arch and a have heel/midfoot stride. I like some room in the toe box, but I find Asics for the most part to be too wide, and I feel my forefoot is kind of “swimming” in those (Kayano and Pursue). My first pair was a Ghost 4, size 10. It was perfect for my feet, always reliable and no blisters or uncomfort what so ever (short runs, speed runs, intervalls, long runs). Then I tried the Asics Gel Pursue, and it was ok, but not great. Went back to the G6 size 10, and the feel from the G4 was gone. It felt smaller, narrower and I actual had to remove the innersole to feel any kind of comfort in those shoes. I actually had to run a marathon in The Asics Gel Pursue because of the discomfort in the G6. Purchased earlier this year a pair of G7’s, size 10,5 this time, and the feel was back! It was perfect and felt even better than the G4. I lowered my marathon PB with 11 minutes in this shoe (Im a laid back runner, my PB in this shoes are now 4:05 on the marathon). Now I want to try something lighter for marathon, but I think I need some cushioning and some stability. Considered the adios boost 2, but read that it was not a shoe for runners with low arch. Any suggestions on what lightweight I can try? high arch, neutral (slightly over pronates on my right foot) runner and need som cushioning? Any of the Adidas Boost maybe? I really like the G7’s though, but are looking for some options in my rotation. The Boston Boost comes to mind. It has got cushioning+support, and the upper fit is slightly roomier than adios (that is purely comparative, because the adios runs super narrow). Worth giving it a fit trial to find out how they fit. Another alternative is the Nike Lunartempo – it has a very shallow toe bumper,but the forefoot fit on both sides is accomodating, and it is extremely lightweight. I’m so happy I found your review! I purchased a pair of Ghost 7s about 4 weeks ago and started having pain in my left foot. I kept telling my husband that the left shoe felt like it didn’t fit right and he thought I was crazy. After reading your review I checked my shoes and the defect is way worse than the ones you have pictured. They are going back tomorrow. Thank you so much! Even small variances lead to massive fit differences. Happy to know you found our review helpful. Returning the shoes is the right thing to do, that way Brooks will know what’s wrong with their manufacturing process. I just wanted to say how much I love y’alls reviews. I just ditched my G7s to be honest. I went from the 5 to the 7 and I developed massive blistering on my arch. I’ve never blistered before and it felt shoe related so I went in to re-gait analyze/shoe shop at my local running store. I walked out with a pair of Adidas Energy Boost 2s and Nike Pegasus 31s. They both feel lighter than the ghosts, hug my foot better, and even with current blisters/wear marks didn’t rub or hurt. I’m sad about the G7s for sure. I wore 3 iterations of Adrenalines and then wanted a lighter/less supportive/more neutral shoe and went to the Ghosts. Ran 2 marathons in them and now… with the 7s it’s just not the same. Sad day- I’ve been pro brooks for a long time (I still own a pair of green silences!) and am disappointed that this shoe just didn’t hit the same mark. PS loved the reviews on my two new shoes – the speedy feel in the Pegasus 31 is pretty crazy! Thank you for the feedback, and sorry to hear that the G’s didn’t work. Let’s see what the Ghost 8 brings – no news so far. Loved the Green Silences, wonder why they dropped it! It is nice to read the details about how Brooks messed up the Ghost!! I have worn Ghosts for years and run several marathons in them starting with the Ghost 5. I never had a blister or any other problem with them. The Ghost 7’s do not feel the same at all. The landing is not smooth to me nor does it feel as cushioned as the previous models. In the Ghost 7, I quickly developed a blister on my foot. Sorry to hear that. 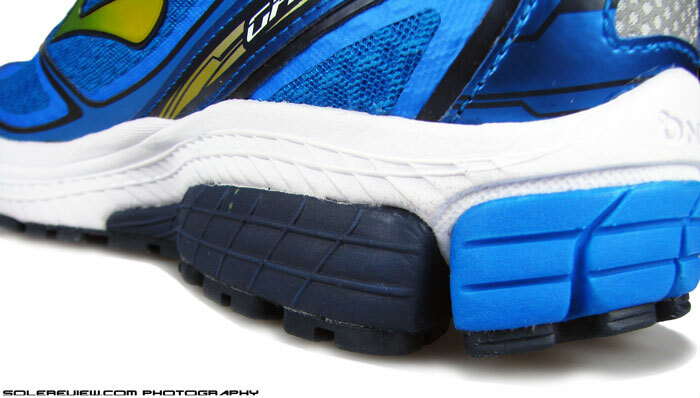 For better or worse, the Ghost 7 is quite distanced from the G-6, as Brooks replaced the Gel with foam. Can’t tell for sure what’s causing the blisters, though. The Ghost 6 were nice, and lucky you could get them. Thanks for stopping by! This is a great site. I’m just getting back to running after 3 yrs of knee issues. I have very flat feet, narrow heel. Have found it best to go with neutral/cushioned and let the foot fall as it may. 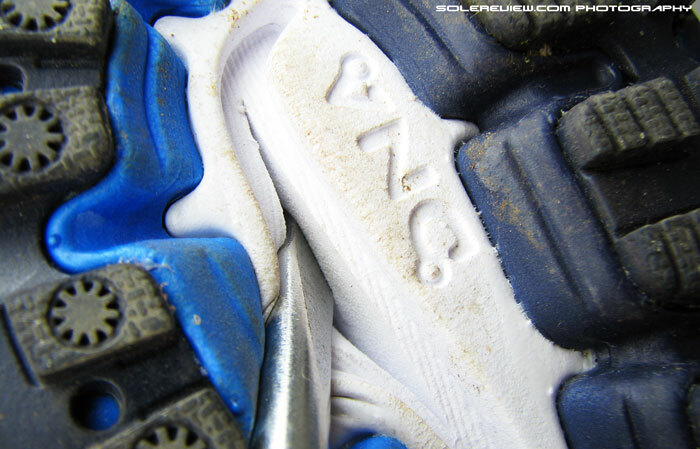 My most successful shoes of the past were the old NB 1060s (size 11 D) and 883s (10.5 D). I religiously did 6 – 8 mi. 5x/week, prior to knee problems . Now, back in the market, I selected the new Triumph ISO. Have found it to be too stiff, and the ISO lace up too snug. Now looking at Ghost 7. Love the toe box and heel. Some of the reviews here have scared me of a bit. My rehab goal is modest 2-3 miles 3x per week. At this point, that would be an accomplishment. Any thoughts, r recommendations? No motion control, no stability, and got to have that toe room. Regardless of what reviews say(including ours), your personal experience with the shoe should guide your purchase decision. If the Ghost 7 fits and feels right, then it probably is the shoe for you. Would also suggest giving the adidas Supernova Glide 7 Boost and the Nike Zoom Vomero 10 a try. Both are worth trying; even if you don’t end up buying them, at least the process will refine your perspective. I tried on a pair of Ghost 7s at the store and I think they were the most comfortable running shoes I ever put on. I tried on several of the other top brands and models as well to compare and these felt best to my sensitive feet. I was kind of concerned about the new super DNA though. You said it seemed like most other foams but I noticed that Runners World said they did a lab test on the Ghost 7s and said they had more cushioning. Still I’m kinda spooked on the new Super DNA and went ahead and bought Ghost 6s because of the non Newtonian gel. I own Glycerin 11s, Nimbus 15s and Triumph 10s. Love the Glycerins and Nimbus are good, but not so sure about the Triumphs, experienced sharp pain in arch and hip pain the other day running in them. I wish I could get some Glycerin 10s but they appear to have vanished off the market, even ebay. When I get the Ghost 6 in the mail I plan on going to the store and trying them on next to the Ghost 7. I’ll let you know how they feel. Great blog, keep up the good work. Appreciate the feedback. The Ghost 7 is a nice shoe, except that we fail to understand what SuperDNA actually does, in context of Brooks original DNA concept. Not sure what runnersworld means when they say there is ‘more’ cushioning. These things tend to be pretty vague, with no clear disclosure of the testing methodology. The Glycerin 10 is one of our favourite shoes, we still have a pair! Well, apparently Brooks themselves are saying (a Brooks representative explained it like this) that in simple terms they ‘blended’ the old DNA with regular foam to achieve a balanced kind of cushioning as opposed to only having a heel and forefoot DNA pad. So they DNA is still there, just invisible and everywhere at the same time, or something like that. If or how that’s actually true and effective, I cannot say. Thanks. The foam does not feel special in any way when running, though. We’ve always found the long term durability of Brooks rubber wanting in relation to other brands. Should be an easy fix for somebody with Brooks’ experience though. A tweak of the compounding/formulation should do it – like how Nike’s outsole last longer than Brooks, without feeling like pieces of rock glued to the underside. The ghost 7 is the worst shoe I have ever had. It’s advertised as a neutral shoe, but seems suited to only the most severe underpronator. The low to the ground squishy lateral side paired with a high and hard medial side means your foot feels like you’re walking on an uneven surface at all times. The uneven compression means the outside of your foot will be in agony after a few hours of walking as strange lateral forces push your weight onto the small bones between ankle and pinkie-toe with each step. If you have super high arches and severe underpronation, this shoe might work for you. If you have neutral pronation and normal/low arches, these shoes will be torture. We suggest you try the Transcend. Not this year’s edition (V2), but the V1. Puzzling categorisation of that shoe by Brooks, but the ride is super smooth. I am currently training for a full marathon that is in October, and I have been training in the Ghost 6. They are starting to wear down so I need to buy new ones. I planned on buying the Ghost 7’s since they are cheaper now since the Ghost 8 came out, but after reading this review I am skeptical about changing to the Ghost 7s or the 8s for that matter because of Brooks switching from the DNA gel to the foam. I have tried on both the 7’s and 8’s, but can’t tell if they will work for me without actually running in them, and I don’t have a lot of time for trial and error. I was able to find the Ghost 6 online in my size, but have read that it isn’t the best to buy older models of shoes because they can start to break down in the warehouse or sitting on the shelf. So I thought I would seek your advice. Would it be best to stick with the Ghost 6 or move to the 7 or 8? 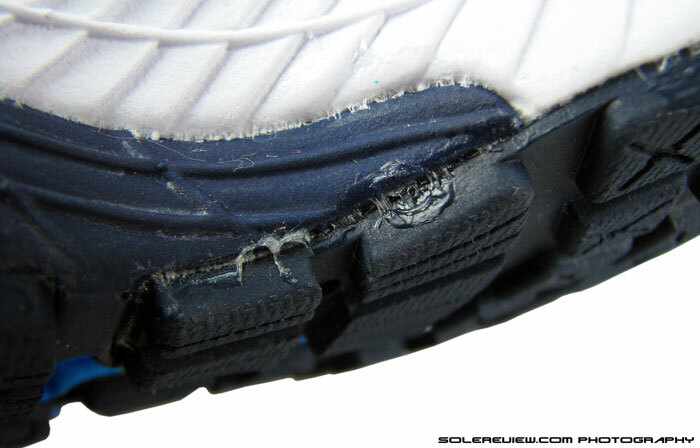 Modern shoes have a much longer shelf life, so it is unlikely that a new pair of Ghost 6 will breakdown. If you don’t want to go the Ghost 6 route, then buy a pair of Ghost 8 – better built than the G-7 for sure. Cushioning not comparable to the G-6, however. Wish I had read this review before I went with the Ghost 7. I have a neutral step but high arches and went with this after other reviews about good shoes for that foot type. I run 5+ miles about 3 times a week and my last pair was Asics Gel Nimbus. I’m not impressed with these at all. In fact I think the Ghost 7 has been the worst running shoe I’ve ever had for comfort and fit. These shoes take my normal step and supinate it. It is not a comfortable fit inside either but curved up around the edges. TERRIBLE shoes. Thank you for sharing the feedback! i am a slightly underpronator, with heel landings. my weight 76kg. After using nikes, (1000 km on them) the store recommends this ghost 7 due to the fact that with the nikes,my right foot is swinging a bit too much in them (plush but not guiding). This was not happening with the ghost according the video footage. Appreciate the detailed feedback, thank you! The Pegasus 31’s outsole durability is one of its strongest suits, and that should apply to the Pegasus 32 too. Sorry Simon, won’t be able to help here. If it is indeed Hallux rigidus, professional medical advise should help in finding out the exact cause, and what attributes should your shoe have.